I suggest picking it up from a table to really appreciate the Nokia Booklet 3G. 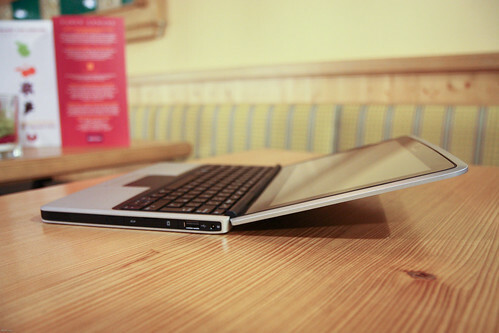 It feels and looks like a lighter, smaller version of Apple Macbook. Even the keyboard and battery feel similar. That’s not definitely a bad thing because I love my Macbook. The Booklet 3G is priced at 575 Euros. I’m surrounded by bloggers and journalists who use their computers a lot and I haven’ heard anyone complain about using the Booklet 3G’s keyboard yet. I also like how much I can tilt the display backwards. I noticed some performance issues. I’m not sure whether to blame it on its RAM (1GB) which is not expandable, but the devices I’ve played with aren’t running on final firmware. Stay tuned for some video walkthrough soon. via Nokia Booklet 3G Hands-On and First Impressions.